Blackberry Ltd, formerly Research In Motion (RIM), launched its flagship phone Blackberry Z30 on Wednesday, in a desperate do or die bid to survive the Darwinian competition from East Asia. It is no secret how ruthless the smartphone world has become. In this globalized marketplace, customers are extremely picky. They want the best design, best hardware, best software, best Apps and best audio-visual experience. So is the Z30 up to the task in stemming the hemorrhaging Blackberry has suffered in its market share, profits and stock price? Let us find out. The Z30 sports an all new 5-inch AMOLED touch-screen with 1280 x 720 resolution and 295 ppi. This may be news to Blackberry fans, but ancient history for Samsung, the reigning king of smartphones. Samsung, Sony, and even the upstart Huawei from mainland China have introduced sharp, clear, stunningly beautiful screens as large as 6-inches. Sony is a particularly apt example since it has been at the losing end of the smartphone wars for many years. So how did Sony use its manufacturing prowess to grab the limelight? Introduce a smartphone with the world’s largest screen. At 6.4 inches of full-HD display, potential customers will certainly take note. Not so for poor Blackberry with its puny little 5-inch screen, dependent on the mercy of its off-shore manufacturing suppliers in East-Asia. The Z30 has a 1.7GHz Qualcomm Snapdragon S4 Pro dual-core processor, Adreno 320 graphics, 2GB of RAM and 16GB storage. You can expand the 16GB to 64GB using a microSD. Along comes a 2-megapixel front-facing camera and an uninspiring 8-megapixel rear camera with f/2.2 lens and 1080p HD video recording capability. The non-removable 2880 mAh battery is a welcome addition and is estimated to run 12-hours of video playback. In addition, the Z30 includes the obligatory wireless functionality including 4G LTE, dual-band Wi-Fi a/b/g/n, NFC and Bluetooth. The hardware is certainly no push-over, but not class leading either. This means potential customers will have a hard time figuring out the vow factor and rush to their nearest wireless provider to try out the Z30. 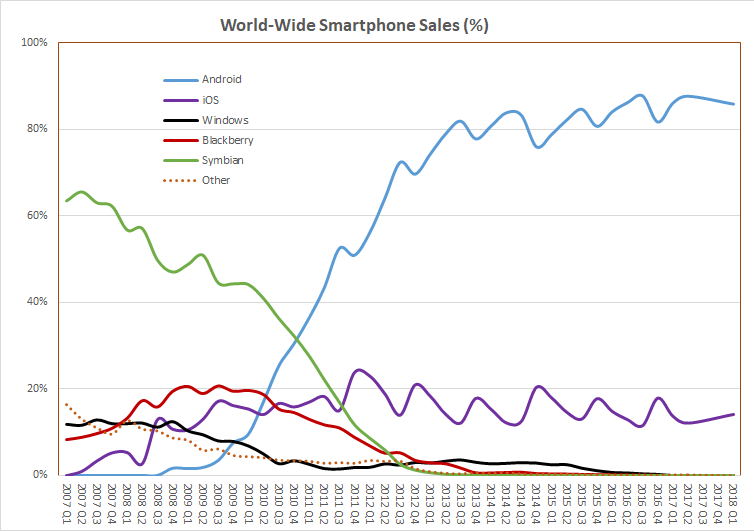 With 80% of the operating system market-share cornered by Android in less than 5 years, Blackberry has been caught flat-footed. It would be a miracle of the 21st century, if the market-share of Blackberry 10 v10.2 crosses even 5%, let alone trounce the Android-iOS duopoly. If there was any doubt that Z30 was a game changer, it would have immediately reflected in Blackberry’s stock price. But the almighty market offered a tepid response to the release. In coming days, as more fans and potential customers use the new OS, things might change for the better. But don’t hold your breadth. Nokia learned the hard way and ended up latching on to Microsoft’s teat, so the clock is definitely ticking for the boys from Waterloo. 5. Waterloo at Kuala Lumpur? Blackberry unveiled the Z30 at an event in Kuala Lumpur. Kuala Lumpur? What is that? For the curious, but geographically challenged, it is the capital city of Malaysia, a newly industrialized country in the heart of South-East Asia, and close to Bangkok, the popular tourism destination for Westerners. Now I have nothing against Kuala Lumpur. It is a beautiful city, famous for spicy Malaysian cuisine and the architecturally dazzling Petronas twin-towers. But if you are a smartphone company struggling to survive in the intensive care unit, why choose a venue that lacks the demographic heft or the gravitational pull within the design, fashion and tech-world? London, Paris, Shanghai, San-Francisco, Singapore, New York, even Tokyo would have been far savvier destinations for unveiling the Z30. Huawei, Lenovo and ZTE should send a thank you note to the individual in-charge of choosing Kuala Lumpur. Finally, I do not want to hurt the feelings of Blackberry faithful, but unless the “free” trade policies that have destroyed the American manufacturing are abolished, sell your Blackberry stock and phone as soon as you can. Apple remains the last great Western-origin consumer electronics giant standing, and Sony, Samsung, LG, Huawei, ZTE and Lenovo are not going to raise the white-flag anytime soon. East Asians – the Japanese, Koreans, Chinese – are not as naive when it comes to manufacturing and trade policies.